Are you guys looking for Good Learning platform? 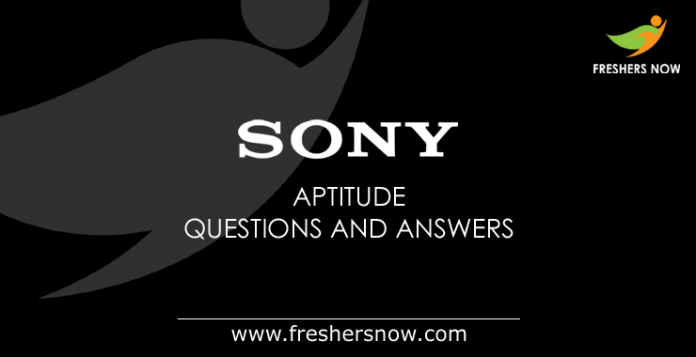 No more worries, here we have gathered the sample Sony Aptitude Questions and Answers along with explanations. Generally, most of the students work very hard to clear Aptitude section. By practicing Sony Aptitude Questions and Answers For Freshers (2018, 2019 & 2020 Batches) you can easily crack the exam. At first, you should have an idea on the test pattern. So, we have arranged the model Sony Aptitude Questions and Answers with Explanation according to the exam pattern in order to reduce the difficulty level while preparation. Make sure that you prepare all the questions given in this page. Along with mentioned topics you need to cover the rest of the topics involved in the quantitative aptitude section such as number series, mensuration, simplification, permutation, boats & Streams, volume & Surface area, ratio & proportion, etc. Well, Students should be very careful while referring all the topics along with subtopics. Because the Aptitude section is very important for any placement exam. Moreover, most reputed companies like Sony is going to recruit the most skillful, dynamic & talented candidates. Therefore, Aspirants can improve their skills by practicing sample Sony Aptitude Questions and Answers with Solutions. Getting a job in such a reputed company like SONY, not an easy task but it is possible with good preparation. It involves much hard work, You can do hard work with smart thinking by practicing Sony Aptitude Questions and Answers along with Explanation. Therefore, this is a great opportunity for the candidates who are preparing for placements to gain knowledge. You can download Sony Aptitude Questions and Answers in PDF format which is attached at the end of the page. Aspirants can directly download these Questions and save your time during the preparation process. 2. 5 11 20 43 82 ? 4. The ratio of the present ages of A to B is 5: 3. The ratio of A’s age 4 years ago to B’s age 4 years hence is 1: 1. What is the ratio of A’s age 4 years hence to B’s age 4 years ago? 6. At present, the respective ratio between the ages of A and B is 3:4 and that between A and C is 1:2. six years hence, the sum of A, B and C will be 96 years. what is the present age of A? 7. 5 years ago the average age of a family of four members was 40 years. Two children were born in this span of 15 years. The present average of the family remains unchanged. Among the two children who were born during the 15 years, if the older child at present is 8 years older than the younger one, what is the ratio of the present age of the older child to the present age of the younger Child? 8. The present age of Swapna is one-fourth that of her father. After 6 years, the father’s age will be twice the age of Naveen. If Naveen celebrated the fifth birthday 8 year ago, What is the Swapna’s Present age? 9. A boat covers a certain distance downstream in 2 hours, while it comes back in 2 1/2 hours. If the speed of the stream be 5 kmph, what is the speed of the boat in still water? Speed upstream = (x – 5) kmph. 10. A man can row 8 km/hr in still water. When the river is running at 4 km/hr, it takes him 2 1/3hr to row to a place and comes back. How far is the place? 11. The area of a rectangle gets reduced by 9 square units, if its length is reduced by 5 units and breadth is increased by 3 units. If we increase the length by 3 units and breadth by 2 units, then the area is increased by 67 square units. Find the length and breadth of the rectangle. 12. The perimeter of a square is equal to twice the perimeter of a rectangle of length 8 cm and breadth 7 cm. What is the circumference of a semicircle whose diameter is equal to the side of the square ? = 2 * 2 (8+7) = 60 cm. 13. Mahesh and Sumanth entered into a partnership investing Rs. 10000 and Rs. 8000 rep. After 3 months Umesh joined them with an investment of Rs.12000. What is the share of Sumanth in a half-yearly profit of Rs 7200? 15. A and B started a partnership business investing some amount in the ratio of 3: 5. C joined them after six months with an amount equal to that of B. In what proportion should the profit at the end of one year be distributed among A, B & C? Explanation – Let the initial investments of A & B be 3a and 5a. A: B: C = (3a x 12) : (5a x 12) : (5a x 6) = 36 : 60 : 30 = 6 : 10 : 5.